Chicago Mayor, Rahm Emanuel is in a runoff for re-election. However, it is for an office he bought, paid-in-full four years ago, or so he thought. Jesus “Chuy” Garcia with United Working Families and the Working Families Party are moving into action to form an entirely new model of progressive, grass-roots political action that will liberate Chicago. If Garcia were to win the election it would be historical for Chicago, Democrats and all progressives. This could alter life as we now know it. This would mean that ideas are still more powerful than money and grass-roots politics is still growing and still working. This is a race that can be won. This general election has a huge Democratic electorate and it is highly likely that few will turn out to vote, especially for Mayor Emanuel. Progressives, however, will invest in the win. It is all about the man Mayor Emanuel is and what he stands for. Mayor Emanuel was Executive Director of the Democratic Congressional Campaign Committee, then he worked digging up dirt on other people’s opponents, but he was best at fundraising. Now, he’s a “political operative.” He has little experience liberating people with any grass-roots progressive movement, he says he does not like liberals. When Mayor Emanuel was 30, he was among politics’ brightest and best. He was Bill Clinton’s 1992 finance director and ran the most impressive fundraising the Democratic Party ever saw. At the same time, he was working for Goldman Sachs (a violation that was never investigated or questioned). When Clinton was voted into office, Mayor Emanuel became assistant to the president for political affairs. However, he offended too many people and lost this job. Clinton kept him as senior advisor for policy and strategy. He was not a good candidate for that job either. Mayor Emanuel used a lot of profanity and was not articulate. He preferred to talk about tactics but not policy. Mayor Emanuel had huge contempt for unions and liberals. However, always spoke fondly of the rich. Mayor Emanuel handed out depraved personal attacks: a dead fish in newspaper for a late report. Some thought him a clown, but most feared him. Mayor Emanuel left Clinton in 1998 and without any experience in finance walked into a job in an investment bank and walked out two and a half years later with $16 million. He had no previous experience in real estate either but he was put on the board of Freddie Mac and made more money while Freddie Mac fell into bankruptcy. Mayor Emanuel became Obama’s chief of staff, putting together a team of economic advisors. These advisors were extremely conservative, more so than Grover Cleveland’s economic advisors. Whether it was due to the advice of his advisors or his own doing, Obama is still trying to recover from some of those choices. Mayor Emanuel’s image became that of a cold-blooded force not to be toyed with. 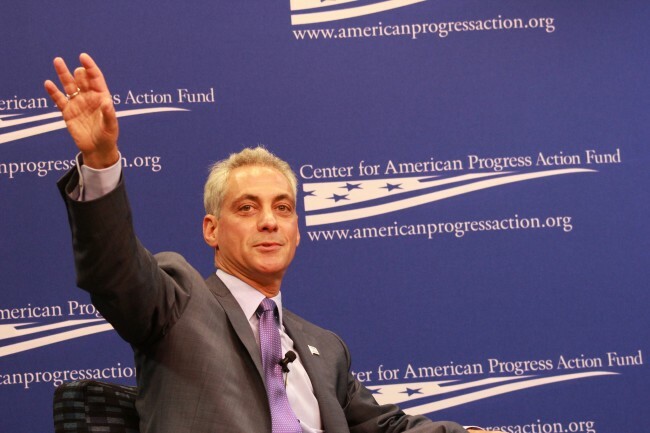 Once he was elected Mayor of Chicago, he was the “Keyser Soze” of Democrats. He reveled in this reputation. Emanuel used his platform for two primary agendas: corporate education reform and privatization. He created an astringent teachers’ strike and 50 public schools closed their doors. Most of these schools served low-income communities. July 4th weekend, there were 82 shootings and 14 deaths on the National news concerning Chicago’s murder rate among young black men. Mayor Emanuel did not have the patience or leadership to step up. Mayor Emanuel’s privatization is not going well either. In 2012, the transit authority hired a private contractor to give out transit cards for people without bank accounts. These cards could be used like prepaid debit cards for the transit authority. The fees, however, were buried deep. People even had to pay money to close an account. The company that conned the poor was paid $454 million. Garcia has also spent a lot of time in politics and that is where the similarities between Garcia and Emanuel end. Garcia was a protégé of the late Mayor Harold Washington. Chicago is stuck between a war on reform and a war on factions. Garcia is a leader. When he was 28, he was elected to city council. He served the city for seven years and then was elected to the state senate. He was on the state senate for six years and then lost a primary. Garcia went into the non-profit sector and was the director of a corporation for community development. Garcia returned to politics four years ago winning an election to the Cook County Board of Commissioners. Garcia has principles and he stands by them. Garcia is also working with a grass-roots movement that will hopefully liberate they way we view politics. Even though Garcia has all the things one would assume President Obama would look for in a candidate, such as: being a Chicago community organizer, part of the progressive wing of the Democratic Party and he is a Mexican immigrant, the President had to go with his former chief of staff Mayor Rahm Emanuel. Even though they do not agree on much, Obama is pledging his loyalty to Mayor Emanuel. Tuesday, the Chicago political establishment was in shock. Emanuel got 45 percent in a five-way race when he needed 50 percent to win re-election. There will be a runoff between incumbent Emanuel and Garcia for mayor. This will be a first for Chicago. There has never been a runoff for mayor before. The runoff will be held in April. Garcia confronted Mayor Emanuel about Chicago’s rise in crime as well as the Mayor’s decision to close 50 schools. He claimed the schools were either “under-performing” or “under-utilized.” The very powerful teacher’s union of Chicago is backing Garcia. In a Chicago Poll run by Ogden and Fry the runoff between Mayor Rahm Emanuel and challenger Jesus “Chuy” Garcia is a dead heat. Ogden and Fry have stated that the Hispanic population is not well represented in this data, so Garcia could be even with Mayor Emanuel. The poll included 979 voters: Mayor Emanuel had 42.9 percent and Garcia had 38.5 percent with a margin of error +/-3.07 percent. The polls also show that 18.6 percent were undecided. The hope is that as Chicago learns more about Garcia and his agenda, he will gain more support. There have been other polls the past couple months and the election last Tuesday suggests Garcia could become the next Mayor of Chicago. There is also a hope that this grass-roots movement backing Garcia may even liberate Mayor Emanuel. One Response to "Mayor Emanuel vs. Grass-Roots Liberation in Chicago"